Kingdom Hearts 3D: Dream Drop Distance is an action role-playing game developed and published by Square Enix. 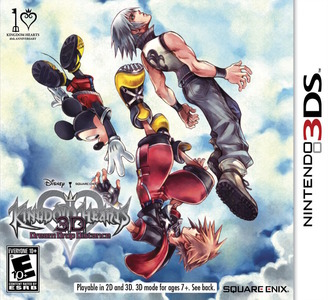 Taking place after the events of Kingdom Hearts Re:coded, the game focuses on Sora and Riku's Mark of Mastery exam in which they have to protect parallel worlds in preparation for the return of Master Xehanort. Besides controlling the two playable characters across a single scenario, the player is able to recruit creatures known as Dream Eaters that are able to assist in fights. Kingdom Hearts 3D suffers from some slowdowns, especially in large areas and playing the initial cutscene when you boot up the game. Despite that, the game is still beatable with only minor graphical issues.